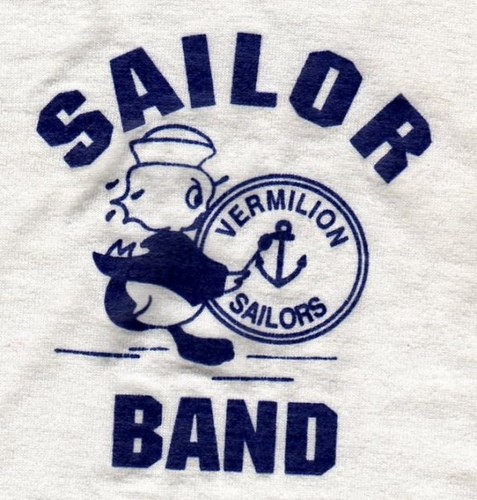 We are now a little more than two months away from our annual performance at the 2012 Sailor Marching Band Festival on September 22nd and it’s time for you to begin letting me know if you will be able to attend and be a part of this year’s gala event. Please reply to this email with your (hopefully) affirmative response and also remind me what instrument you will be playing and if you need that instrument from the school. I will be nailed to my computer chair with pen in hand awaiting your positive response. If you can’t do it this year, write back anyway. I’d love to hear from all of you and see what is happening in your lives. I do respond to all the emails I get from you. Being the dinosaur that I am, I don’t have a Facebook page and I’m not likely to get one, so if you don’t do emails any more please contact Mary Ana Hicks or my bride, Pat Price so I get the word. We always have a music practice on the Saturday before (this year it’s 9/15) from 9-11 AM. It is not required, but if you can it will certainly help many of you. We don’t memorize our music and we do use lyres and carry our music on the field. If you can’t aquire your own lyre or flip folder, we will have some available for purchase on 9/22. On the festival day we begin rehearsals at 9 AM break for lunch at noon, return at 1 PM and rehearse as long as we need to or are able to. The Festival begins at 7:00 PM and we as Alumni participants get in free. DRESS: If you are new to the group this year, we wear yellow band shirts with the group name on the front and your grad. year on the back. We need to order them ahead of time, so if you need one–let me know about that when you respond (also remind me about size and grad. year) so we can have that for you on the day of the festival. They are, about, $14.00. On the bottoms–we wear light tan, khaki slacks. Avoid blue jeans please. Tennies are fine on your feet as long as they’re not hot pink, florescent green or some other garish color. If the weather gets cold for the festival, putting something white (first choice), purple or gold (see a theme here) under the band shirt is perfectly acceptable. If it gets that cold we’ll be more interested in warmth than uniformity. If it rains—well, you’re on your own, but–it’s not going to rain. As far as the show itself is concerned, I’m working on it. There is just too much good music out there. Hey, we may even take one of Zach Gleason’s requests this year–who knows? Once the tunes have been chosen, I can send you the music if I have your recent address (e and snail mail) in the files. Of course, if you know of any other alumni who would like to participate, send them to me via this email or our website– http://vhsalumniband.org/ We’d love to have them “do it one more time” with us. Majorettes and Flagline folks, please contact Dawn or Lee to indicate your desire to perform. I haven’t gotten all the data files of the class of ’12 members yet, so if you know of any of them, tell them about this and have them contact me. Thank you for all the suggestions I received over the year for preferred songs. I’d love to be able to program every suggestion that was given to me and we will attempt to do some of those songs as the show changes through the years. OK–start practicing and get back to me if you can do it this year. As always–it’s going to be a blast!!!!!!!! !